I can count the number of times I went to UST. My first memory of UST was of one of my brothers studying there. It was followed by a sadder one — an uncle confined for several months, and eventually dying in the university hospital. There was also the memory of me taking the college entrance exam, then later on chickening out of the interview. Though I have these memories of UST, I never really explored the campus nor delved into the university’s history. The University of Santo Tomas is one of the oldest universities in the Philippines, turning 400 years on April 28 next year. 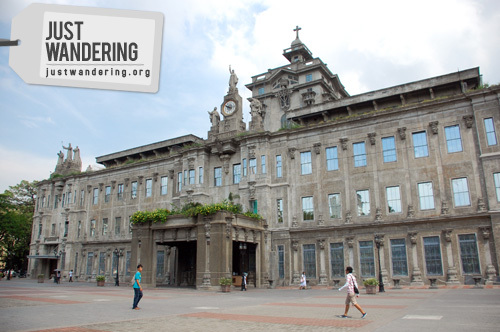 The sprawling campus located in España Blvd is not the original campus; the university was established within the walls of Intramuros. All that remains of the former campus was the Arch of the Centuries, which was a part of the original facade. 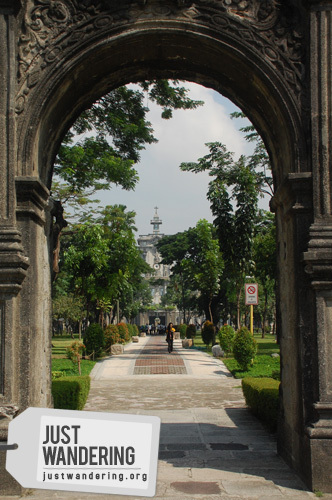 This arch is very symbolic to the UST students: they walk through the arch as freshmen, signifying their entrance into the university. Once they graduate, they walk through the arch once more, signifying the completion of their education. Our student guides didn’t dare walk though the arch, as superstition goes that they will not graduate if they do so while they are still undergraduates. UST has changed a lot since my previous visits. Buildings have sprung up everywhere. Surprisingly, even with the continuous development, the campus was very green. There were plenty of trees that shade you from the sun as you walk from building to building and wide expanses of grass that just begs you to roll around with wild abandon. One of the major stop in our tour of the campus was the Main building. Built in 1927, the building is earthquake-resitant: built in segments so that it sways with the earth. Housed within the building is the UST Museum of Arts and Sciences, which is filled with stuffed specimens of various animals and cultural artifacts of the ancient Filipinos. Very detailed illustrations. No Photoshops here! 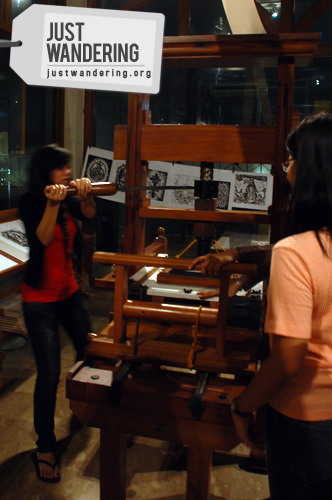 The highlight of the tour was the Lumina Pandit Exhibit, which showcases historical treasures of the UST Library. Among the treasures inside was a book from 1492 that shows a very impressive justified text alignment. 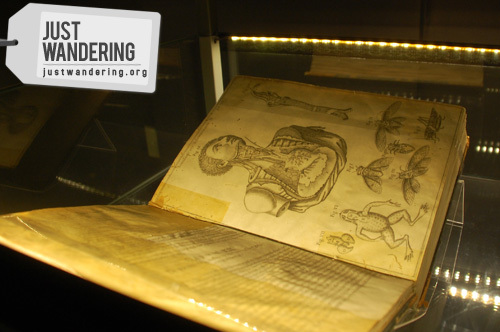 Other books in the collection include a tome penned by astronomer Nicholaus Copernicus and Opera Omnia by Coi Hippocratis. Also on exhibit are the original academic records of Dr. Jose P. Rizal, and a printing press that lets you experience the effort made into publishing books in the old days. The Lumina Pandit Exhibit will be open until January 30, 2011 at the ground floor of the Miguel de Benavides Library. Admission is free for UST students, while non-UST students pay Php 50 each. Discounted price of Php 25 apply to groups of 10 non-UST students or students of Dominican network schools. The exhibit is open from Tuesdays to Saturday, 8am – 12noon and 1pm to 5pm. It is closed during University holidays. For inquiries, call the UST library at (02) 731-3034 or e-mail them at library@mnl.ust.edu.ph. Been to UST for my eldest Entrance Exam. Was not able to go inside the main building which is our lost. But we did had a good time going around. uy, namiss ko ang aking school. there’s no superstition regarding the arch of the century, baka bagong imbento lang yan these past few years..when i was studying there wala naman. before, the UST ground is more simple than now..but still i would love to go back there over and over again..
Outonvacation: Haha, yun nga lang! Mabel: Loko yung mga batang yun ah! About that Pandit: The Guard at UST library had too many reasons saying alumnis are only welcome at 4pm, when you go Monday they say its close on Monday despite we can see the lights on at the Exhibit. Whats next? seems likeits not open to alumni card holders. I’m an alumna. Sa totoo lang, karamihan ng Tomasino ay hindi talaga lumalabas sa Arch until maka-graduate sila. In fact, none of my classmates dared exiting the arch when we were still undergrads. And yes, the Main Bldg. was the first earthquake-proof building in the Philippines. Galing! Another thing Ms Nina, I was reading your blog about your second time in Cebu (I’ll be going there soon that’s why I’m researching! hehe) and it was mentioned there that the University of San Carlos is the oldest in Philippines–false. It is UST. USC cannot present any proof that they are indeed the oldest in the country. Well, I have my issue of Varsitarian (UST newsletter) wherein an article was written to prove that.